"Dear children, it is not easy to be a nun. It is not a life of refuge from the world. It is a life of sacrifice. In a way, it is a life against nature. It is a never-ending struggle for self-perfection." It's somewhat curious that seminaries and convents are barely accessible to laity, yet it is in these communities where the Catholic Church's clergy receives its formation and the necessary tools for their vocation. The cloistered world of convents is the subject of Fred Zinnemann's quietly observant The Nun's Story. Based on Kathryn C. Hulme's novel, Zinnemann's movie looks into the daily life of a nun with sensitivity and intelligence. There's a timeless quality to the story, which focuses on a Belgian girl who leaves her family to become a Bride of Christ. Gabrielle van der Mal (Audrey Hepburn) is intelligent, beautiful, and mildly pig-headed upon joining the convent in 1930. Neatly setting her jewelry on her bedside table, Gabrielle leaves her worldly possessions behind as her doctor father (Dean Jagger) escorts her to the convent. Shortly after entering into the nunnery's austere world, it becomes clear that Gabrielle will struggle with this life. In addition to the regulations concerning silence and obedience to the Reverend Mother Emmanuel (Edith Evans), Gabrielle wrestles with her pride and pines to work as a nurse in the Congo, despite Mother Emmanuel's insistence that she hasn't matured enough for the position. 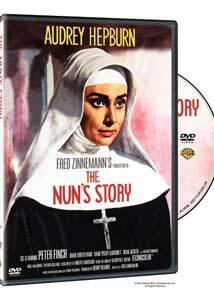 Zinnemann and his screenwriter, Robert Anderson, vividly present the daily life of a convent. The rituals and meditations are a far cry from being cinematic, but cinematographer Franz Planer creates elegant compositions and dresses the film in a humble visual strategy that evokes the nature of a nun's life. With time and further spiritual struggle, Gabrielle becomes Sister Luke and is sent to work as a nurse in a sanatorium. She is disappointed with this position, but resolves to accept Mother Emmanuel's decision and use her position to increase her virtues of charity and humility. Sister Luke, however, is not quite able to submit herself to her order's rules. Racked with inner-turmoil, she begins to realize that being a nun is far too demanding and contrary to her own personality. Things don't get any better when she is finally allowed to work in the Congo alongside the atheist Dr. Fortunati (Peter Finch). Despite her best efforts, Sister Luke is far more suited to being a nurse than she is to being a nun. The Nun's Story is not so much a film concerned with plot as it is a spiritual character study, looking at the moral dynamics of a nun's life as opposed to the issues that may arise from vows of celibacy and poverty. The screenplay wisely steers clear from developing a love story between Sister Luke and Fortunati, allowing instead for the good doctor to play as a moral antagonist to his assistant. Finch is exquisite in the part, perfectly capturing the complexities of Dr. Fortunati�a man who devotes himself selflessly to the sick, but ridicules the clergy who dedicate themselves to the spiritual needs of their flock. Equally impressive are Edith Evans and Peggy Ashcroft, the latter of which plays Sister Luke's superior in Africa. Both women inhabit their habits with grace, helping to convey a human dimension to characters that could easily be written of as nameless bureaucrats. Set to the ethereal Franz Waxman score, Fred Zinnemann's film is both a fantastic star vehicle for Hepburn and a compelling drama. At times some of the scenes play as forced, especially when a Congo native attacks a nun, and the highly stylized violence is cheesy. For the most part, though, Zinnemann chooses to keep the movie squarely rooted in the minutiae of convent life. Nearly every scene features Hepburn and she makes a lasting impression. This is one of her finest performances, as she brings an unmistakable intensity to the role of Sister Luke that sells the character's moral struggles at every point in the film. Her performance carries a sobering effect that anchors the story in reality. I can't pretend to know what it's like to be a nun, but The Nun's Story certainly gives its audience a good idea. For that, Hepburn and Zinnemann deserve an enthusiastic amen. Image Transfer Review: The anamorphic 1.85:1 image is about as good as one could hope for, though there still are some notable flaws in the transfer. Mosquito noise is fairly constant throughout the film and there are some instances of print defects, but otherwise this is a crisp image with a strong film-like look. Detail is largely impressive and colors feel natural. Black levels aren't quite as detailed as I would hope, but contrast is acceptable. Audio Transfer Review: The original monaural sound mix is preserved on this DVD, delivering a crisp and clean representation of the theatrical experience. Dialogue is always audible and I didn't notice any significant flaws. A French mono mix is also available. Extras Review: The only supplement included is the film's original theatrical trailer, presented in anamorphic 1.85:1 widescreen. It's visual quality certainly shows that the image transfer improves upon existing film elements, but that's about the only insight offered here. The Nun's Story is a touching, delicate film about the daily life of a nun in a modern world. Anchored by Audrey Hepburn's outstanding performance and Fred Zinnemann's sensitive direction, this film is a must-see. While the DVD is light on extras, its presentation faithfully preserves the original theatrical experience and makes it a wonderful starting point in Warner's Films of Faith Collection.